Have you ever taken on a task you know you shouldn't; not because of lack of ability, but because of the mental stress required to reach your goal? For me this stress is completely self induced. When I bake I want things to be perfect, I constantly forget perfection does not exist. Here's some history: This year I decided I would make my own birthday cake. A right of passage for any baker I think. I found an amazing recipe (Brown Eyed Baker's Peanut Butter-Fudge Cheesecake) and although the cake ended up turning out delicious, when I took it out of the oven I thought it was going to be a disaster. I mean it had the San Andreas running through it. At one point I even threatened to toss the entire thing in the garbage, ridiculous I know since “cheesecake is cheesecake no matter how small”. In the end it turned out really well and I felt pretty foolish about my over reaction (although we'll keep that between you and me). So, how does someone like me follow up an experience like that? OH I KNOW! I'LL BAKE A BIRTHDAY CAKE FOR MY MOM! I know my mom really enjoys vanilla, and I had never actually worked with a real vanilla bean before, so I had decided on a vanilla bean cake. 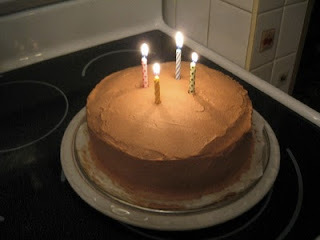 I had previously bookmarked one from Cookie Baker Lynn, based on recipe from Sky High, Irresistible Triple-Layer Cakes. However, since we are not a big family, nor a family of giants a three tier eight inch cake is a little more then needed. As such, I felt I should scale the recipe to a two tier eight inch cake. Much more reasonable. Granted doing this is not always simple, not everything is so easily broken up into thirds. I went with my gut and altered the recipe in a way that I felt would not impact the overall flavour and texture of the cake (I'm definitely making this sound more epic then it is. Basically a monkey with a calculator could do it, so I should have almost no problem). I decided to use the entire bean so there would be an ample amount of vanilla flavour. However, the white chocolate frosting seemed too heavy for what I wanted. And this actually posed my biggest dilemma, what frosting do I go with? I wanted something light that paired well with vanilla, and ultimately decided on a chocolate whipped cream. And since I had fresh cherries in the house (thanks Grandma! :)) I decided on a cherry whipped cream filling. I made a fresh cherry puree. Mixed the whipped cream ingredients. And then neglected to follow instructions and added the cherry puree to the cream before I had whipped it to soft peaks. What did this mean? Less whip, more cream. But still not a complete disaster, it was very tasty after all. Think fresh cherry ice cream without the cold. The real disaster (and the core of my stress) came as I put the cake together. Because I hate wasting cake, I refused to level the bottom side of the top tier. So I placed it on top of the first layer and pressed down enough to spread the cherry filling so it wouldn't spill out of the sides. This error lead to having pretty much no filling other then at the ends of the cake. To me, this was a disaster. However, everyone enjoyed the cake. It was dense, but very moist. I have read that egg white cakes are notorious for drying out, but this was not my experience. The vanilla flavour was excellent and the chocolate whipped cream was light, fluffy and mild. What you could taste of the cherry filling worked well with the rest of the cake, and made me confident that I had made the right decision. Had I built the cake correctly, it would have taken it to the next level. Regardless of this error, my Mom really enjoyed it, and when I think about it now, that's really all that should and does matter to me. Even after this experience I'm still opposed to cutting away cake to even it out a layer. Next time, round side up. Who cares if it looks like a hamburger? It's the taste that matters. And who doesn't like hamburgers? Surely a person I do not wish to associate with :). **Note: This was the first time I did everything one shot based entirely on weight. I based my value of cups on what I saw on the packaging, I'm going to do an update as to why this is not always a good idea. 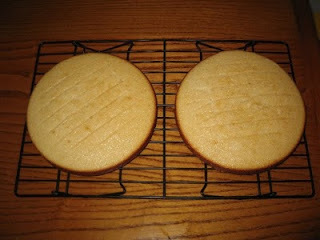 Preheat oven to 350F and grease 2 - 8 inch round cake pans (I like to line the bottoms with parchment paper, makes it much safer to remove cakes when they're done). In the large bowl of a mixer add all dry ingredients (including sugar) and set mixer to low. Place vanilla bean on parchment paper and split down the centre with knife. With the tip of the knife scrape out all the seeds you can (you don't have to do it in one shot like on TV :), you can go over it more then once). Add vanilla seeds, butter and the first 2/3 cup of milk to the mixer bowl and set on medium speed. Beat until fluffy. (If the vanilla beans are a bit dry and seem difficult to cut, you can steam them for a minute or two, or I found leaving them on the stove stop as the oven heats up works quite well). **Great tip from Cookie Baker Lynn: Add used vanilla pod to jar of white sugar and let sit for a week to make vanilla sugar. In a medium sized bowl whisk together egg whites and vanilla extract with the ¼ cup milk. Pour mixture into the batter in 3 additions, allowing liquid to incorporate before adding the next. Pour batter evenly into greased cake pans. Bake for 25 – 30 minutes or until toothpick comes out clean (mine took 27 minutes). Leave cakes in pans and cool on racks for 10 minutes. 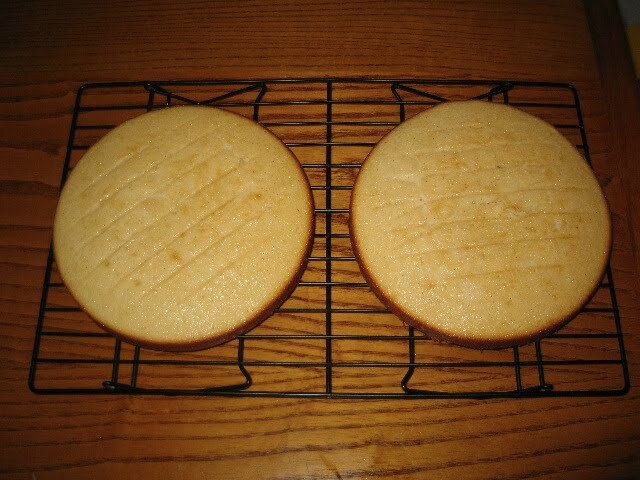 Remove cake from pans, and parchment paper from cakes, and allow to fully cool (bottom side down, not inverted, I find that if I cool inverted on a rack the cake always sticks when I take it off). The original recipe says about 1 hour to cool, I say closer to 2. **Note: I found that the weight and density of the cakes was unexpectedly heavy. I expected much lighter from a cake based on egg whites, so don't worry, this is normal (at least for this recipe). In a small mixer bowl (or if you prefer to use a hand mixer or do it by hand that would be my recommendation, since using my mixer didn't work great). Add all ingredients, give a quick stir and place in fridge for 1 to 2 hours. Remove from fridge and stir. Turn mixing device to high and whip to stiff peaks and place in fridge until ready to build cake. Add pitted cherries and sugar to food processor and run until smooth (or as smooth as it gets). Taste and add more sugar if you feel necessary. In a small mixer bowl (see above) add cream and sugar and whip until soft peaks form. Add cherry puree in small doses and whip to stiff peaks. Place first layer round side down and spread a liberal amount of cherry filling on top (you may have some left over). Choose to use the top layer as is and place it either round side down (dangerous :)) or round side up (hamburger style – what I will do next time); or even out top layer and place cut side down. Press down very slightly and make sure cake is lined up evenly. Frost entire cake with Chocolate Frosting (start with the sides and end with the top), using as much or little frosting as desired. (I prefer a thin layer of frosting so I had a lot left over, but most will probably use a lot more if not the entire thing). For tips on dirty icing a cake I suggest you look elsewhere, since I can't figure it out for the life of me :). That's so thoughtful that you baked a birthday cake for your Mom. There's no one here to do that for me so any time you want the practice feel free! Love Aunt J.